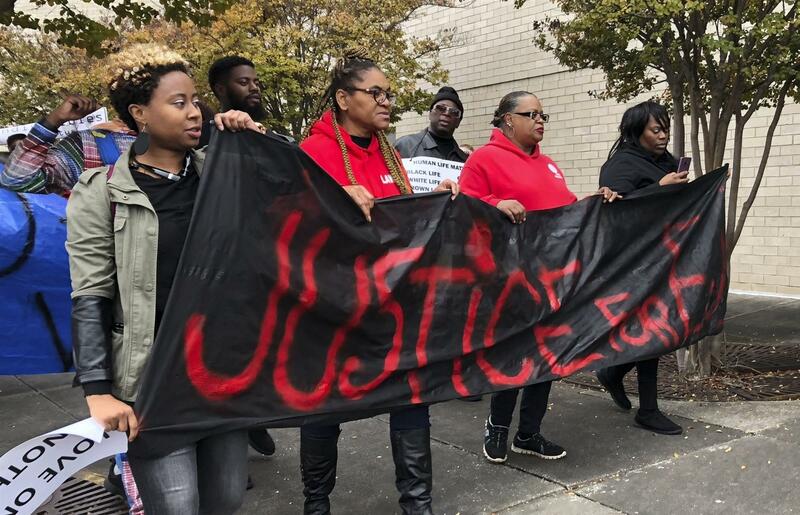 Protesters carry a banner reading "Justice for EJ" outside the Riverchase Galleria shopping mall in Hoover, Ala.
Federal officials are investigating an Alabama mall shooting in which a police officer killed a black man he had mistaken for the gunman. News outlets report U.S. Attorney Jay Town issued a statement Friday that the U.S. Department of Justice has been reviewing and is continuing to investigate the shooting death of 21-year-old Emantic "EJ" Bradford Jr.
Alabama Attorney General Steve Marshall announced Tuesday that the officer will not face any state charges. The state's investigation determined that the police officer in the Birmingham suburb of Hoover was justified in shooting Bradford because Bradford was carrying a weapon and appeared to pose a threat. That decision has prompted outrage among activists. The Alabama NAACP says Marshall's decision essentially tells Alabama's black residents their lives don't matter. The officer mistook Bradford for the person who fired shots moments earlier in the Riverchase Galleria shopping mall in Hoover on Thanksgiving night.